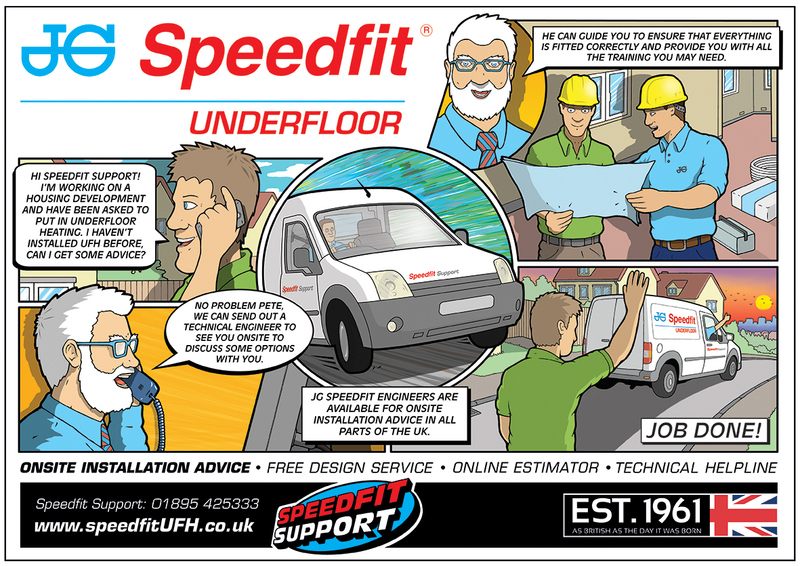 Speedfit Support UFH Advertising Campaign. 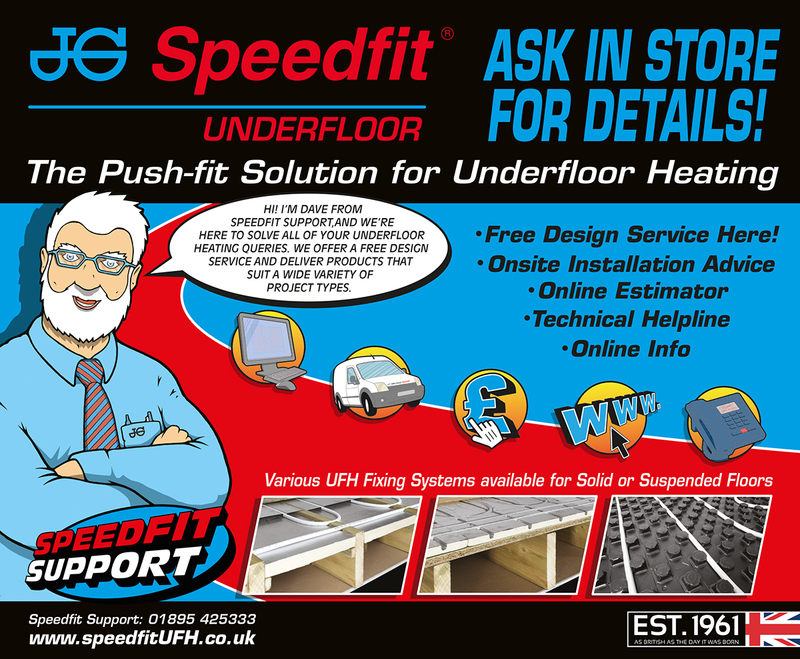 1: To communicate Speedfit Underfloor's key messaging and forge a point of differentiation for Speedfit UFH to hopefully create a unique position in a crowded marketplace. The messaging will focus on superior project support & customer guidance across a suite of services. This suite being called 'Speedfit Support'. 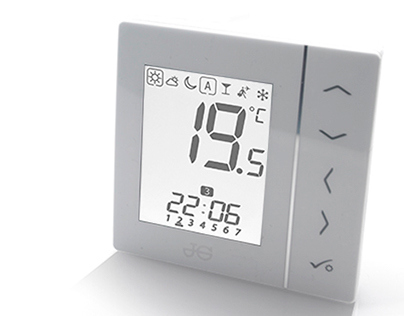 2: Portray the company as one that removes the confusion surrounding correct installation and usage of their UFH product - we 'keep things simple' and are with you throughout the full process. 3: Try to create a feeling of genuine partnership and build a relationship with their plumbing customers. 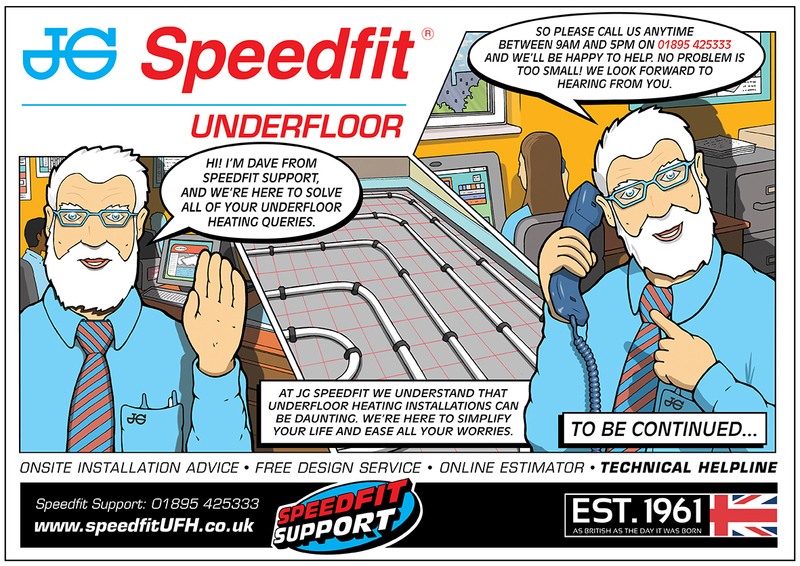 It was decided to go with a comic strip format as it will primarily serve to break through the clutter of Underfloor Heating messages in the sector, there is nothing else like it. 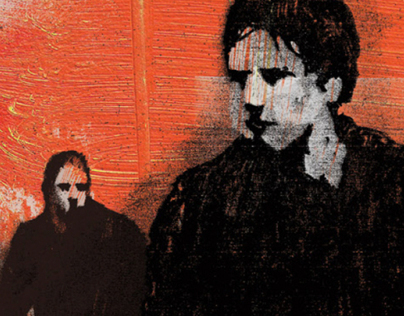 This format also allowed the story to be told clearly and concisely allowing for flexibility in speech / message content. 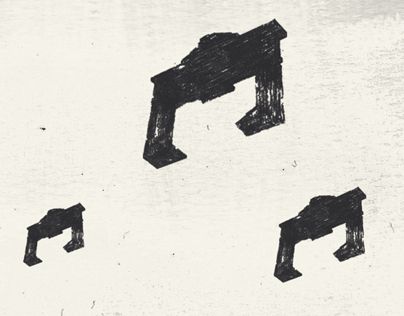 The lightheartedness of the approach can appeal to consumers and make the brand seem more approachable. 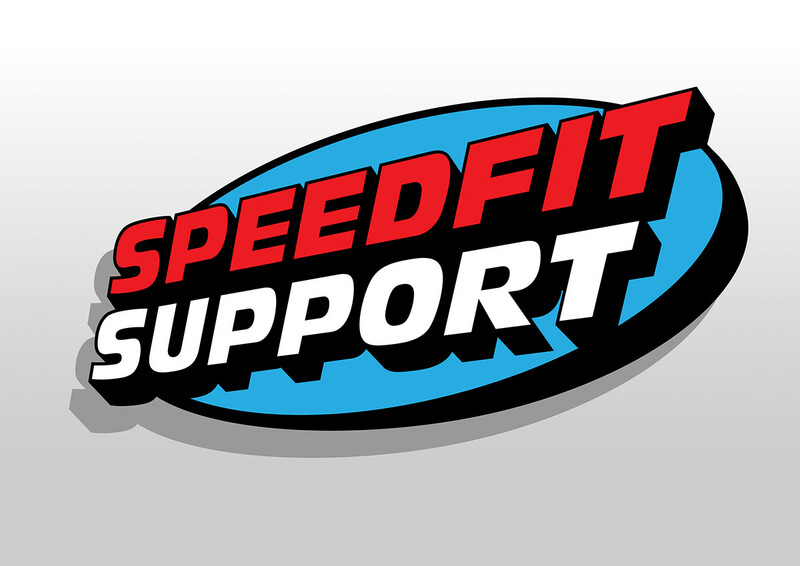 To re-inforce this message an Icon was designed to represent each of Speedfit Support's services on offer. 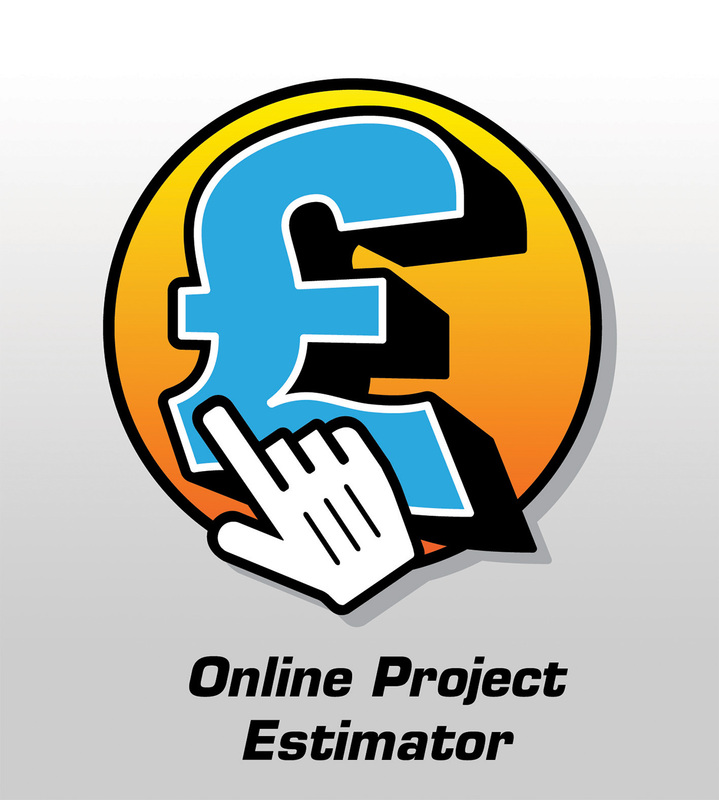 These consisted of four main services that are a Free Design Service, Onsite Installation Advice, Online Project Estimator and a Technical Helpline. 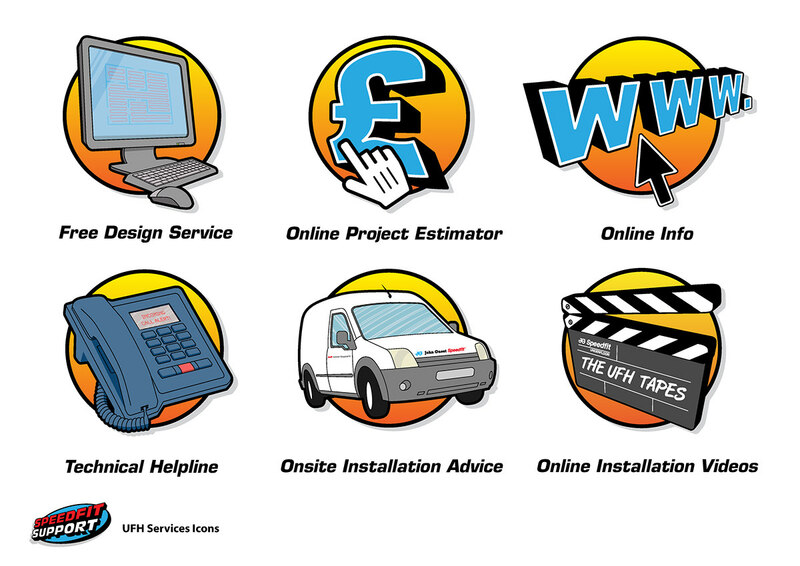 Other parts of the Speedfit Support package which had icons designed for them included Online Installation Videos and an Online Info icon. 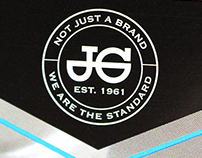 A character Dave was also created to be the company mascot for this campaign. 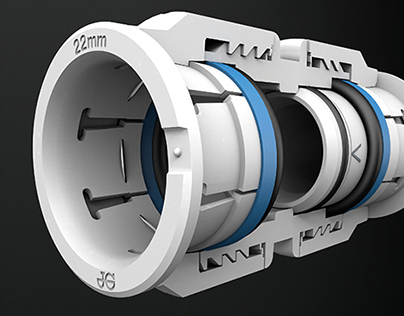 Press Advert - Series of 4 ads that introduces each of the core Speedfit Support services to the customer. 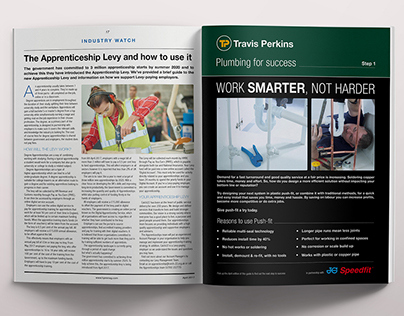 Series was printed quarterly in plumbing and heating installer magazines. 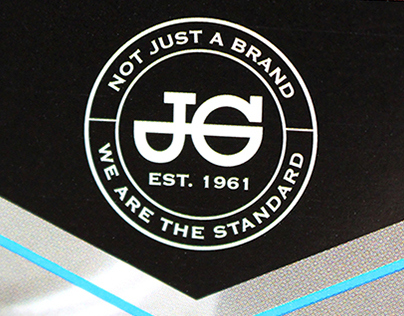 Distributed across the UK. 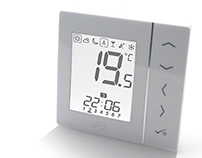 Above is the first of the series 'Onsite Installtion Advice'. 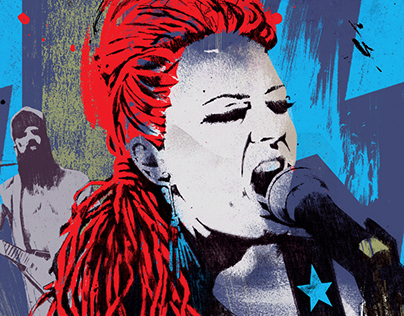 Below are some close ups of the ad. 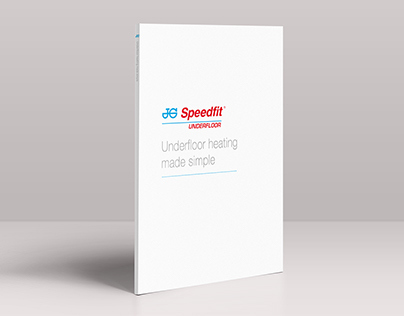 Large Display Board: Displayed within retail outlets across the UK selling JG Speedfit Underfloor Heating products. Board size: 2000mm High x 2430mm Wide. The 2nd advert in the series: Free Design Service. 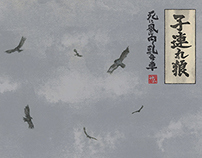 Retail Outlet - Promo Poster. 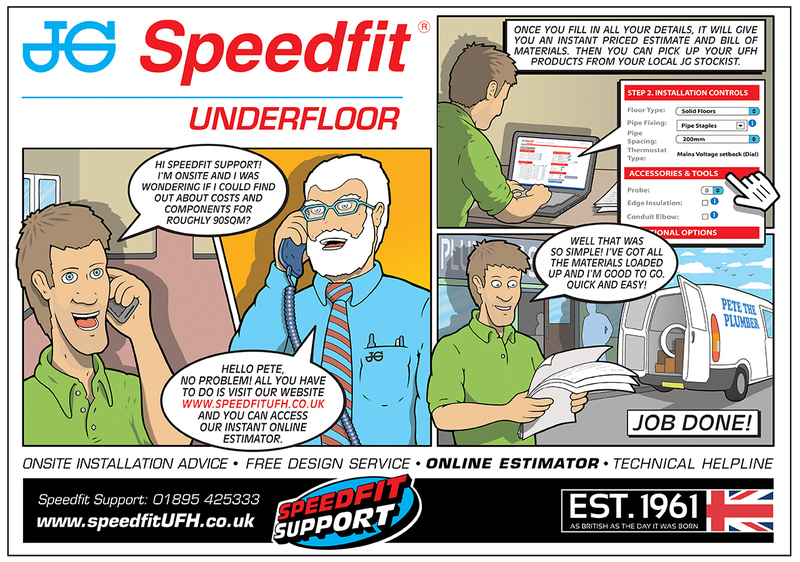 The 4th comic strip ad in the series: Technical Helpline. 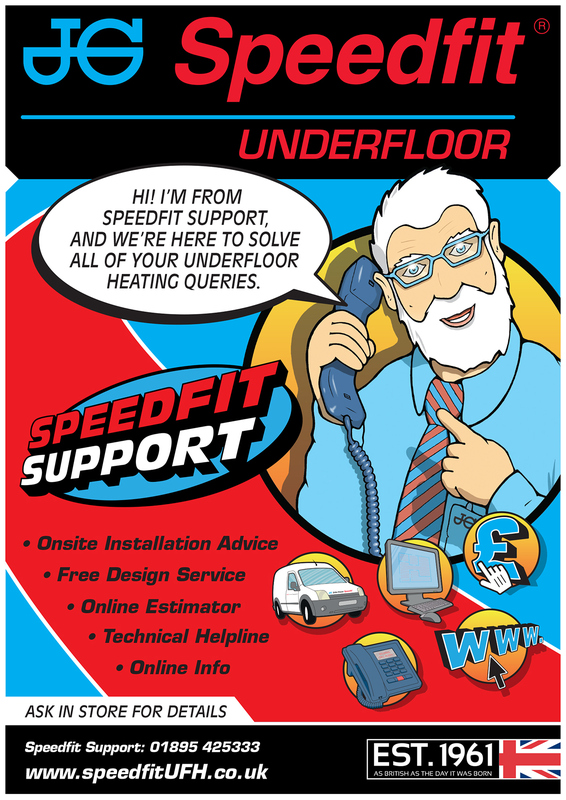 'Dave' illustrations used within items like email blasts promoting Speedfit Support's Online Installation videos and various services / offers. 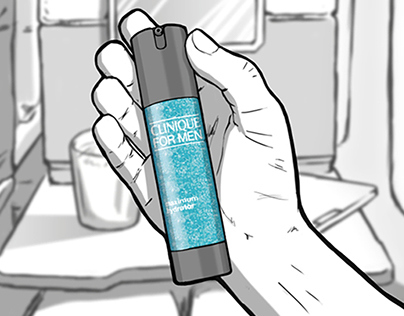 Below are 2 examples of the first drafts / concepts for the series of 4 Comic Strip Ads. 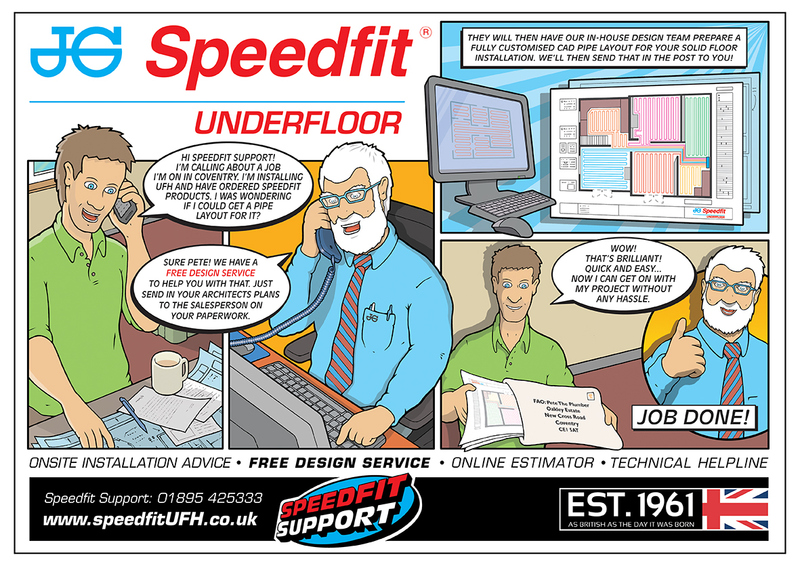 Artwork and design for Speedfit Support UFH Advertising Campaign.